In Chap. 5, Verilog was presented as a way to describe the behavior of concurrent systems. The modeling techniques presented were appropriate for combinational logic because these types of circuits have outputs dependent only on the current values of their inputs. This means a model that continuously performs signal assignments provides an accurate model of this circuit behavior. In Chap. 7, sequential logic storage devices were presented that did not continuously update their outputs based on the instantaneous values of their inputs. Instead, sequential storage devices only update their outputs based upon an event, most often the edge of a clock signal. The modeling techniques presented in Chap. 5 are unable to accurately describe this type of behavior. 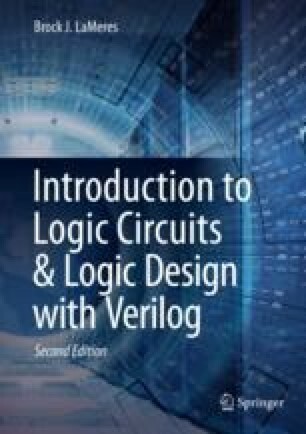 In this chapter, we describe the Verilog constructs to model signal assignments that are triggered by an event in order to accurately model sequential logic. We can then use these techniques to describe more complex sequential logic circuits such as finite state machines and register transfer level systems. This chapter will also present how to create test benches and look at more advanced features that are commonly used in Verilog to model modern systems. The goal of this chapter is to give an understanding of the full capability of hardware description languages.